Partnerships, teamwork, sharing—we teach these concepts to students from an early age, constantly emphasizing their importance. Partnerships build strength, confidence, and skills for both parties, creating a mutually beneficial arrangement. This is as true for adults as it is for students, and there are numerous ways that artistic partnerships can benefit your classroom. One way is to bring outside artists into your classroom through a local arts organization, introducing your students to art forms they may not have encountered in their life outside of school. Arts organizations across the country are available to help, with a wealth of programming for schools and teachers. Some of these organizations have started to create partnerships amongst themselves for an even greater variety of programming and advocacy for arts education, through larger organizations such as PAONE (Professional Arts Organization Network for Education). Artist educator Meara Tubman-Broeren leads a kindergarten class through a movement exercise at Howard Park Public School. Photo: COC. 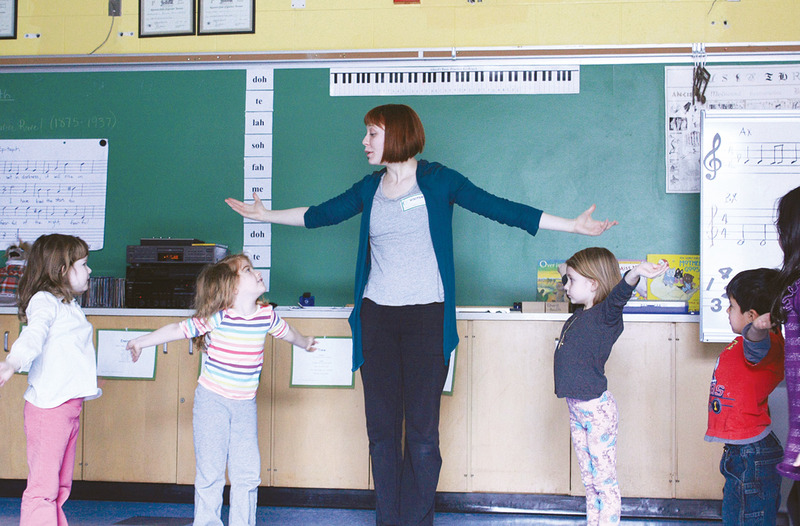 An example of this is the Canadian Opera Company’s Opera Creation Program, which brings multiple artists (including composers, designers and opera singers) into the classroom. These artists work with students and teachers to create an original opera, unique to their school, imparting valuable lessons about their craft along the way. Grade 5 and 6 students at Bennington Heights Elementary School in Toronto are currently experiencing this creative combination first-hand. Grade 5 teacher Stephanie Bloomberg is a strong believer in arts education. “It is through the arts that [students] receive some of the most relevant experiences of their lives. Exposure to dance, music, drama and visual arts allows children to see movement, sound, colours, shapes and textures all come to life, and it always leaves quite an impression on children’s minds. I believe it unlocks the door to several forms of creativity they probably never knew they had.” Though Stephanie already puts a strong emphasis on the visual arts in her classroom, she knew she needed a little outside help when it came to introducing her students to opera. 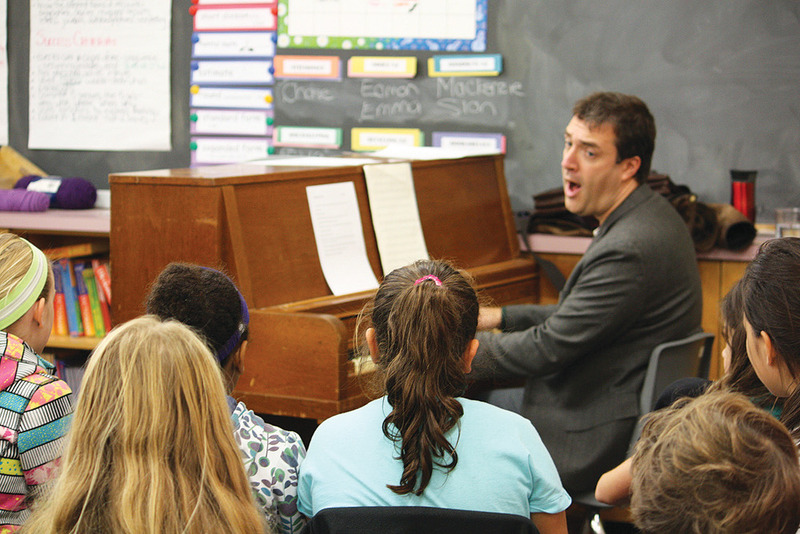 Composer Dean Burry writes the opera’s libretto and music with students at Bennington Heights Elementary School. Photo: COC. Past teachers who have partnered with the COC agree that there is great value in bringing these artists into the classroom. 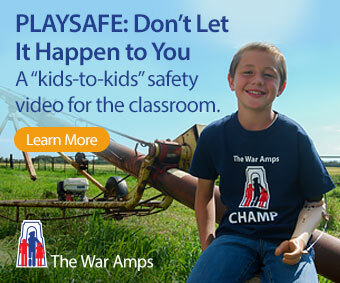 “This program exposes our students to something they would not normally see and/or do. Many of the skills they learned support educational expectations,” says Charles Offor, a teacher at Lescon Public School in North York. During Lescon’s Opera Creation Program, different classes received visits from different artist educators, and each class contributed to the piece as a whole. One class learned the important elements of plot by writing the opera’s libretto, while the school’s youngest students worked with a designer to create the backdrop, learning about shapes and colours along the way. Vanessa Smith is School Programs Manager at the Canadian Opera Company. Previously, she worked as a drama specialist and educator within schools in Ontario and Japan. To learn more about partnering with the COC to bring artists into your school, or about further educational opportunities, please visit coc.ca/Explore or e-mail education@coc.ca.